6 May 2016. Intellia Therapeutics, a developer of therapies based on genome editing, issued its initial public stock offering, raising $108 million. The Cambridge, Massachusetts enterprise, less than 2 years old, issued 6 million shares priced at $18.00. At the 4:00 pm ET closing bell today, company shares trading on the NASDAQ exchange as NTLA were priced at $22.10, an increase of 23 percent, while the NASDAQ exchange overall gained 0.34 percent. Founded in November 2014, Intellia Therapeutics is a spin-off from Caribou Biosciences, an early-stage life sciences company, that develops and commercializes the genome-editing technology known as CRISPR-Cas9. Caribou Biosciences was founded in 2011 and licenses research on CRISPR from the UC-Berkeley lab of Jennifer Doudna, a co-founder of the company, for drug discovery and screening. Doudna is also one of the founders of Intellia Therapeutics. CRISPR, short for clustered, regularly interspaced short palindromic repeats, is adapted from a natural process used by bacteria to protect against attack by viruses, where a protein that deactivates or replaces genes binds to targeted RNA molecules generated by the genome. 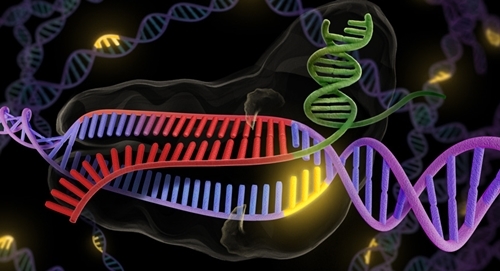 The RNA molecules then guide the editing protein, known as CRISPR-associated protein 9 or Cas9, to specific genes needing changes. Intellia is developing therapies with CRISPR-Cas9 that remove disease-causing genes or mutations, repair genes with mutations found in small regions of DNA, and insert corrected or functioning genes when mutations are found in larger DNA regions. The company says its treatments are being designed to be either administered directly to patients, or delivered to cells taken from the patient, then cultured outside the body and transplanted back. Intellia and drug maker Novartis are applying CRISPR-Cas9 to treatments that engineer chimeric antigen receptor T-cells, or CAR-T, immune-system cells. CAR-T cells attract antigens producing antibodies, cultured and grown in the body, then infused back into patients to attack disease-causing cells. Intellia and Novartis are also working with hematopoietic or blood-forming stem cells, which they plan as well to culture and grow in the lab for transplant in patients. A separate collaboration, with biopharmaceutical company Regeneron, is designing a treatment with CRISPR/Cas9 for the inherited disease transthyretin amyloidosis, a rare disorder caused by a mutation that interrupts instructions to produce in the liver a protein called transthyretin. Without transthyretin, another protein called amyloid builds up on organs, tissues, and nerves in the body, affecting functions of the peripheral nervous system and other organs. Intellia and Regeneron are developing a treatment for the disorder, delivered to the liver with lipid (natural oil or fat) nanoparticles. Intellia is developing on its own similar treatments for other disorders of the liver, including hepatitis B. As reported in Science & Enterprise, Editas Medicine, a competitor of Intellia Therapeutics also developing genome editing therapies, issued its IPO in February 2016, raising $94 million.